Our product range includes a wide range of smoke foil transfer printing machine. we are create all types textile machines according to Customers Requirement Established in the year 2000, we Smoke Foil Transfer Printing Machine, are one of the appreciated manufacturers and suppliers of textile machines. The organization is based at Surat, Gujarat (India) and our distribution network is spread across Maharashtra, Gujarat and Punjab. Hyderabad,Kerala,Chirala,Chennai. All South India,West Bengal ,All Over India the years we have been able to garner a huge client base across the domestic market. Thanks as RegardsOur clients can avail from us Smoke Print And Foil Print Machine. These machines are manufactured using superior quality raw material and thus ensure longer service life. The range is available in various sizes and can also be tailored as per the requirements of our clients. 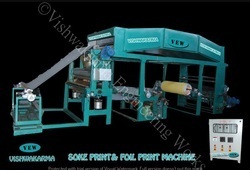 Looking for Foil Printing Machine ?